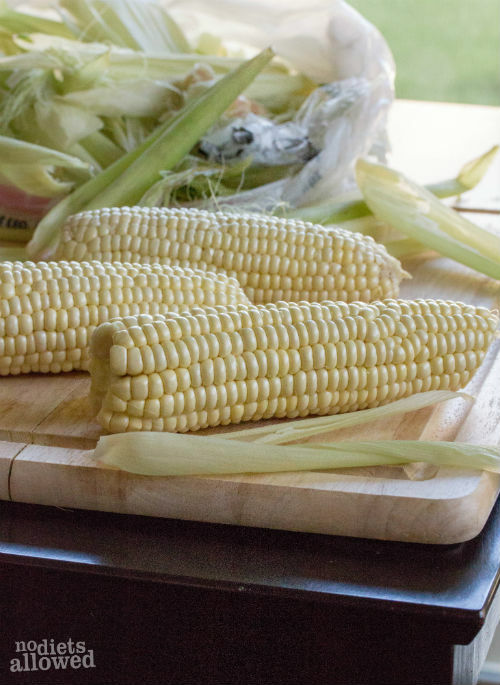 You know those grilled corn-on-the-cob recipes that require you to soak for 20 minutes, pull down the outer husks, strip away the silk by hand, fold them back up in place, and then tie the ends? Yeah… after doing that a couple times, I decided I’m too impatient for that time consuming ritual. Side dishes should not require extensive labor. One night, I skipped all those steps and just husked and grilled! The corn-on-the-cob turned out just as juicy, flavorful, and so much quicker and easier! How many of you are coconut oil fans? If you’re new to coconut oil, let me quickly share why I know you’ll fall head-over-heels for it. First, fabulous slightly sweet taste similar to sweet butter. For those who hate anything coconut flavor, don’t you worry… it doesn’t actually taste ‘coconuty’. Coconut oil is a very healthy fat with health benefits ranging from weight loss, decreases risk of heart disease, curbs hunger, improves hair and skin, kills off bacteria and fungus, boost brain function, and so much more. I bought a large container of Nutiva Organic Virgin Coconut Oil on Amazon about 6 months ago. I use it frequently and have only used about 1/4. I’m not worried about it going bad since it has a shelf life of over 2 years. It’s time to purchase some coconut oil, friends. 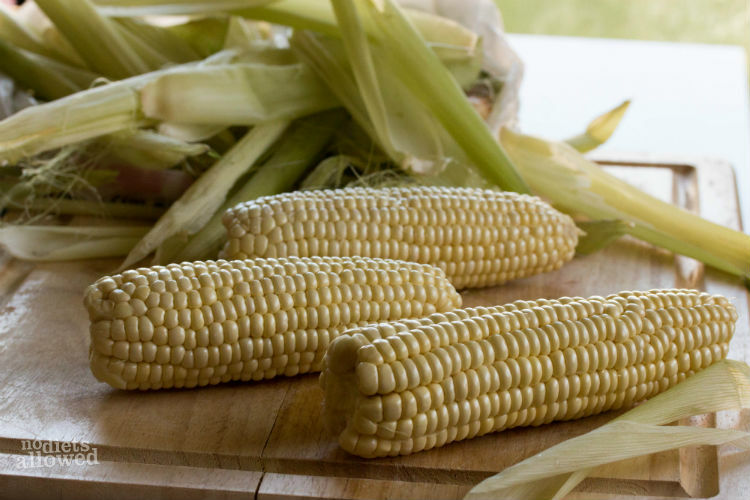 Try it out on this easy grilled corn-on-the-cob first and let me know what you think! Once you’re truly addicted to coconut oil, then head over to try it on my Grilled Tuna Cheese Sandwich. One quick tip. 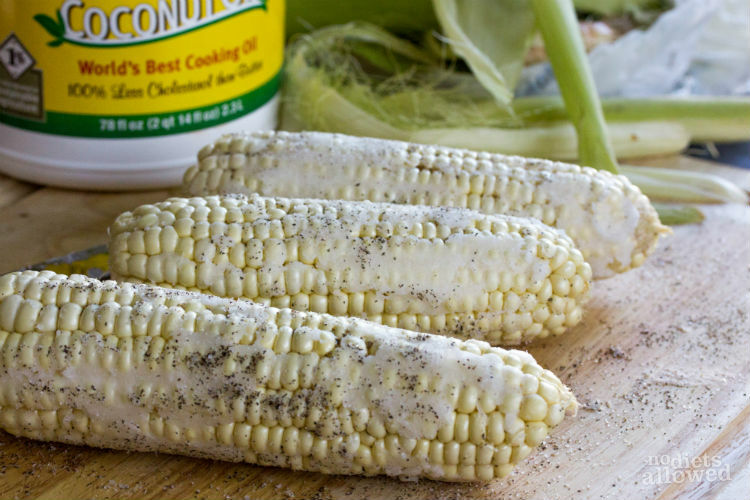 Coconut oil heats up quickly at lower temperatures which means you need to grill your corn-on-the-cob on a low to medium heat. I recommend starting with a low flame first and cook for 1 to 2 minutes on each side. We have had great success with this method, but each grill is unique. Play around with your temperature, but you’ll definitely want to start low first. Once corn is shucked, rinsed, and dried, spread coconut oil evenly on each side. 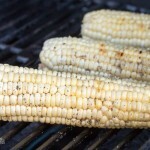 You can either sprinkle each ear of corn evenly with salt and pepper BEFORE grilling or AFTER. Over low-medium heat on the grill, cook corn 1 to 2 minutes on each side until slightly brown. Mini Cobblers and Gender Reveal Recipe!